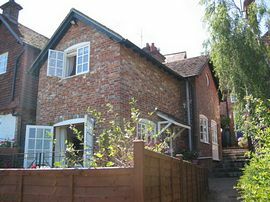 Honeysuckle Cottage is a charming one bedroom cottage, tucked away down a private road, which overlooks the Shimmings valley in the delightful market town of Petworth, West Sussex. The property is ideally situated for Petworth House and Park, Cowdery Park, Goodwood Racecourse and the Goodwood Motor Circuit. Arundel Castle is close by as well as the lovely City of Chichester which is 25 minutes drive to the South Coast. Although Petworth is situated in beautiful countyside it is only 50 miles from Central London and one hour from Heathrow and Gatwick airports. If you wish to travel by train, two mainline stations - Haslemere and Pulborough - are 20 minutes from Petworth. From the kitchen there is a pine staircase leading to the landing upstairs where there is a very large cupboard/wardrobe for clothes and suitcases for your stay. 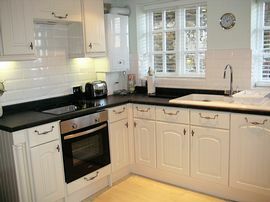 Gas central heating provides hot water and room heating. 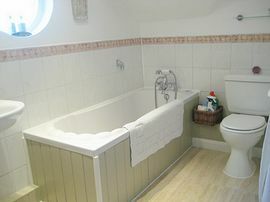 Off the landing is a bathroom with bath and handheld shower. A selection of Molton Brown toiletries are provided. We provide a choice of lightweight Waffle bath robes or fluffy towelling robes along with slippers so you can really chill out. A selection of bath towels is also provided. There is also a hairdryer. Leading from the landing, on a lower level is a double bedroom equipped with a King size iron bed,(2012) with lovely fresh white linen duvet. For those lazy mornings or early nights a LCD TV is there for your convenience. 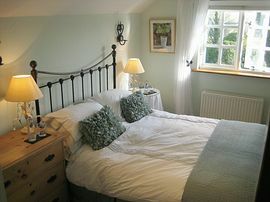 The bedroom has stunning views overlooking the Shimmings Valley. 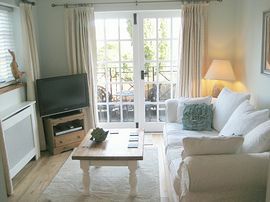 The Cottage enjoys a well stocked garden and a terrace where you can sit with a nice chilled glass of champagne relaxing and enjoying the lovely views. There is a private carpark space for guests. Prices include gas, electricity, towels and linen. A welcome pack is provided for you which comprises, tea, coffee, sugar, bread, milk, butter and eggs to help get you started. All cleaning materials are provided. Available all year round, Saturday is normally the change over day. Short breaks can be arranged during less busy periods. Checkout time is 10am. Checkin from 2pm. Directions will be given on confirmation of booking. £300 - £450 dependent on time of year. Check in times 1400 - 1630 hours, other times by prior arrangement.